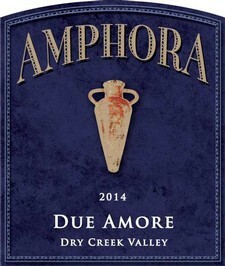 Our Due Amore wine is winemaker Rick’s special blend of two varietals in roughly equal proportion. In 2014, his imagination envisioned this marriage of Cabernet Sauvignon, and Syrah. The Cabernet lends linear structure, a core of dark fruit, and a feel of gravity. The Syrah component hangs on that structure like a tapestry of lush fruit, spice, and mystery. The result is a rich, complex, and intriguing red wine which will reward additional bottle-aging. Simmer something tasty in the slow cooker or dutch oven (beef stroganoff? ), pull the cork from a bottle, and experience how this wine opens up over the course of a long evening. Then plan to get more—only four barrels were produced!